For all the great new games that are released on Android, sometimes you want to play something ... familiar. Maybe something a little retro that reminds you of those arcade days spent plugging quarters into standalone machines for hours on end. To help you find the most interesting arcade adventure for you to enjoy, we looked and discovered a great arcade game that offers you fun and exciting endless tap gameplay – Tiny Flying Animal Adventures. Let’s see what the game is all about. What is Tiny Flying Animal Adventures all about? Highly fun for the whole family, easy to play and developed for android users that like playing entertaining arcade adventure game with challenging tap gameplay. By playing this game with multiple levels, players get to choose between two mini games for playing, having endless fun and getting them addicted to playing on their first try. With fun sound effects of flying and sharp colorful sky design, players will enjoy tapping and flying their bird while avoiding obstacles on the way to keep the bird alive. Endless tap for endless and exciting flying adventure with this arcade tap game. With this tap game for all ages, all players will get their chance to choose between two mini games with interesting adventure gameplay. The mini games offered are go the distance and fly high. If the player chooses to play the go the distance game he needs to tap the bird up while avoiding the rockets and bombs falling trying to kill the bird and end the game. 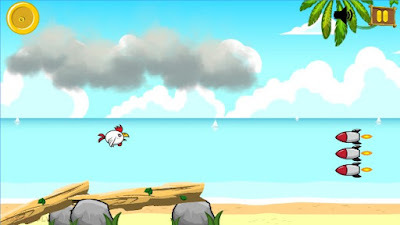 On the second game, fly high, the player needs to tap to get the bird further as possible while also avoiding the bombs and rockets. No matter what game is playing, the player will need to collect the coins that can be used for unlocking new tiny animals for flying and having even more fun. This tap adventure is offering players to choose their own adventure and enjoy flying as long as possible and getting scores for their best achievements. Download it for free now on Google Play and tap to fly the bird as high and further as you can!